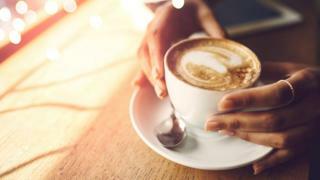 Drinking three cups of coffee a day may help you live longer, according to a study of almost half a million people from 10 European countries. The research, published in the journal the Annals of Internal Medicine, suggests an extra cup of coffee could lengthen a person's lifespan - even if it is decaffeinated. But sceptical experts point out it is impossible to say for sure that it is the coffee that is having a protective effect, rather than say, a more healthy lifestyle in coffee drinkers. They say there is no need to reach for that extra cup of coffee just yet. What does the new study claim? Researchers from the International Agency for Research on Cancer and Imperial College London say they have found that drinking more coffee is linked to a lower risk of death - particularly for heart diseases and diseases of the gut. They came to their conclusions after analysing data of healthy people over the age of 35 from 10 EU countries. They asked them once at the beginning of the study how much coffee they tended to drink and then looked at deaths over an average of 16 years. If true - by just how much could a cup of coffee lengthen lifespan? Prof Sir David Spiegelhalter, from the University of Cambridge, analyses the public understanding of risk and says that if the estimated reductions in death really were down to coffee, then an extra cup of coffee every day would extend the life of a man by around three months and a woman by around a month on average. But despite the sheer scale of the study, it is by no means perfect and cannot prove that coffee beans are the magic ingredient. Frustratingly for coffee fiends, the findings really are not as clear-cut as they might first seem. That's because the study could not take every factor into account - clouding how certain one can be about coffee's effects. For example, it did not look at how much coffee drinkers earned in comparison with non-coffee drinkers. It might be that people who can afford three cups of coffee a day are richer and that extra money, in some way, helps protect their health. It might be that people who drank three cups of coffee a day spent more time socialising and that in turn may have boosted their wellbeing. And even if they were to be certain it was the coffee that was responsible, not every risk improved. The researchers found higher coffee-drinking was linked to a higher rate of ovarian cancer in women, for example. And although the paper looked at a lot of people, the researchers excluded anyone who had diabetes, heart attacks or strokes at the beginning of the study. So it doesn't tell us much about the risks or benefits of drinking coffee if people are unwell. It is also possible some of those people became unwell while having their regular brews. Previous studies have shown conflicting and often contradictory results. For many people, experience suggests that drinks containing caffeine can temporarily make us feel more alert. But caffeine affects some people more than others, and the effects can vary from person to person. NHS experts have not set limits for coffee in the general population but they do say that pregnant women should avoid drinking more than 200mg of caffeine a day. They say this is because coffee might increase the chance of the baby being born too small. Too much caffeine may also increase the risk of miscarriage. And, of course, caffeine is not just found in coffee. The 200mg caffeine limit could be reached by having two mugs of tea and a can of cola, for example, or two cups of instant coffee. There was also recently the case of a US teen who, it's thought, may have died from drinking too many caffeinated drinks too quickly. How could we ever be sure whether coffee makes you live longer? The most rigorous scientific way to be certain that coffee could make you live longer would be to force thousands of people all over the world to drink it regularly while preventing many thousands of otherwise similar people from ever drinking coffee. Scientists would then have to monitor every other aspect of their life - what else they ate and drank, how much they earned, how much exercise they did, for example. That's a study that is never likely to take place. So for now, some experts say, instead of putting all your bets on coffee being good for you, you could instead do something that has been proven to extend life - take a brisk, 20-minute walk to the nearest coffee shop - whether you order a cup or not.